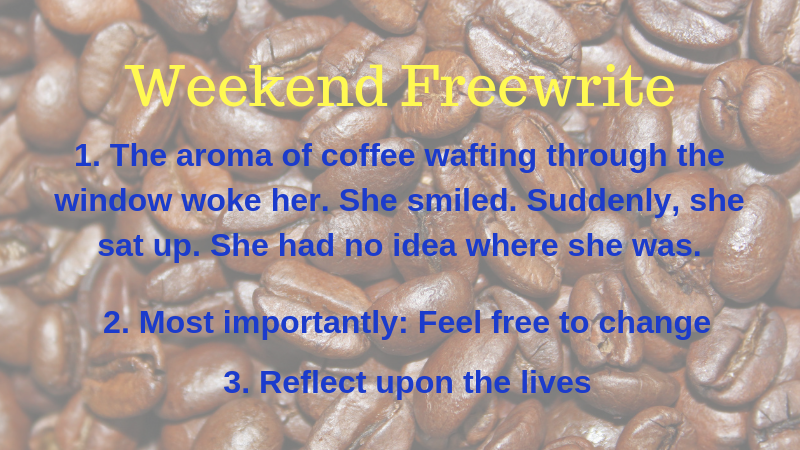 The aroma of coffee wafting through the window woke her. She smiled. Suddenly, she sat up. She had no idea where she was. There was a cup of coffee right next to her bed. That must have woken her. But who would have brought it to her? And most importantly, who was she? She yawned. Maybe this is a dream. The walls are white. Nothing. No picture. Just a few cracks that make her think - what? what do cracks in the wall mean? There is a window with curtains. The curtains are moving. Hmm. she gets up and walks barefoot over to the window. The sun is streaming into the room as she pulls the curtains back. A bath of sunlight reaches all the way to the opposite wall. she sets a foot on it to follow the path - but, a shadow, her shadow is now breaking the golden street as she called it in her mind. Why is it broken? So confusing. Everything is confusin. She is making her way back to the bed. Sits down and lifts that cup of coffee to her lips. It is hot. What does that mean? She knows deep down that it means something. But what? She is trying to think, to figure it out. But her head hurts when she is asking this question. Who am I and what does it mean that the coffee is hot. If you are a bystander, an observer, someone on the outside of the room of this experiment, someone who can read minds, you might think that those are big and small questions to ask all at the same time. Hot coffee and being? Suddenly, a man walks into her room. He has clothing in his hand and lays it out on the bed, next to where she is sitting with the coffee cup in her hand. "What am I supposed to do?" she hears herself asking. "Most importantly, feel free to change," he answers and walks out without looking at her or saying anything else. She sits. She stares. She is trying to think. But somehow, all she can do is look at the sunlight streaming through her room -as if there is the answer. But there is no sleep. Only the coffee reaching her nostrils and asking her to drink. Giving up, she reaches out to the cup and takes a nice sip. The hot liquid runs down her throat and she is surprised that it is so hot. Something stirs in her, remembering that things should cool down if they are sitting for a while. Why, she can't remember. But it feels good to swallow the hot coffee and she wants more. Almost gulping now, she empties the cup and sets it down next to her bed. Immediately, the door opens and the same man comes in, this time with a coffee pot in his hand, and he refills her cup. She wants to speak to him, but nothing comes to her mind. This time, he does look at her - almost with an expectation. She doesn't know what to do besides drinking more of the coffee. This time, it is too hot to just gulp the whole cup. She sets it down and walks back to the window. She sees that there is something outside of the room. Before, the window seemed like the door to the sun- all she could see was the bright light streaming into her room. This time, she steps into the window frame and looks outside. A street. Lots of people in the street. She is above them, maybe 2 floors up and she is lost in a white room with coffee and curtains and nothing else. Oh, a bed. and clothes on the bed. Who, why and where. Thoughts are becoming a bit clearer. The dullness of nothing is slowly lifting from her. She is thinking now. Thinking that this is weird. That this is not normal. That she has to be someone because, deep down, she knows that everyone is someone. She decides to put on the clothing laid out on the bed for her. As soon as she puts them on, she does feel like she wants to twirl, that she wants to be seen. by whom, she is not sure. Meanwhile, the men, watching her from a few rooms away through cameras well hidden in the room are satisfied. They can’t read her mind, but they see that she doesn’t remember. Everything is new. They found the drug to cure those that reflect too much upon their lives.